A Rinkya Blog: Rinkya Collector's Corner- FlyWheels' Transformers! Rinkya Collector's Corner- FlyWheels' Transformers! I started when I was 7 in 1984, but really got into collecting again in 1993 and have been going strong since. 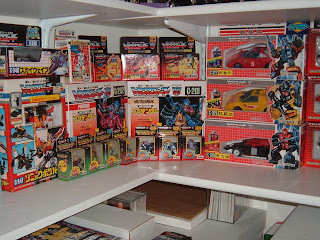 How did you get started collecting Japanese transformers? much more stuff (toys and all) than the U.S. ever got. What is the “dream” item for you? I guess like a lot of other collectors, a complete, mint in box Grand Maximus. What is your favorite part of collecting Transformers? The childhood memories that are attached to the characters/toys and the thrill of finding that hard to find toy. always eluded me. So I was very ecstatic when I found and won that auction. How did you like the movie Transformers? Did it live up to your expectations? Yes, I enjoyed the movie greatly...although I thought some of the humans just "got in the way". Looking forward to the DVD release though as well as the impending sequel! Where can we see your Transformers collection? That is just a small representation of everything Transformers that I own though. I haven't found the time to finish photographing everything else! Thank you FlyWheels for sharing your collection and good luck!